Hey guys! In case you didn't know, I have a nail centric Instagram account, @pblnails, where I post nail art content that isn't on my main Instagram feed for the blog. 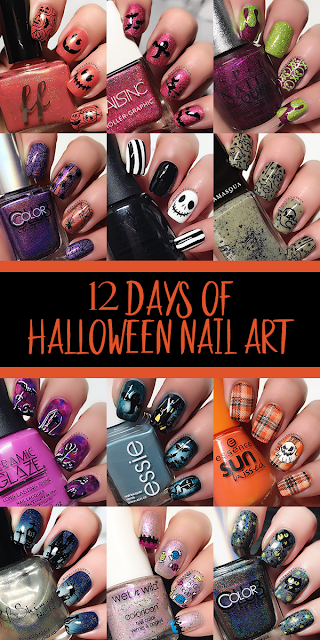 I decided that since I was so excited for Halloween nail art this year, I'd do 12 days of Halloween nail art - which turned out to be quite a huge undertaking. Honestly, because I'm really good at ideas and sometimes not so good at follow through, I wasn't sure that I would maintain for all 12 days, but somehow I managed it! I decided that to celebrate Halloween today, I'd do a roundup of all 12 mani's that I featured over the past couple of weeks! 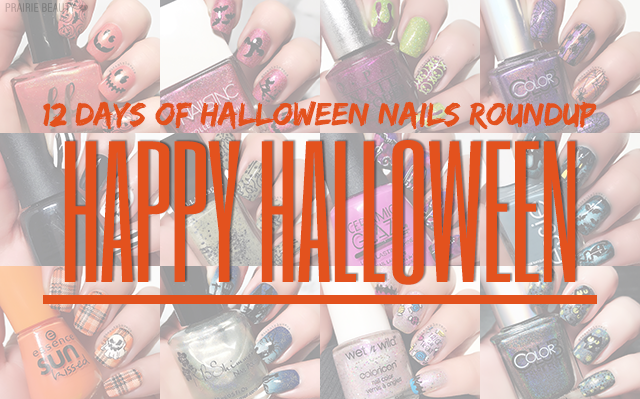 Keep reading to check out all 12 mani's from my 12 Days Of Halloween Nail Art! It seemed only fitting to start out this endeavor by keeping it simple - with a little twist. Flamingo Feather by Femme Fatale is a really gorgeous peachy orange shade with really fine holo in it that doesn't really scream Halloween... but worked really well for a slightly different take on the Halloween black and orange pairing and I love how this one turned out. This mani, admittedly, is evidence that you can get something pretty cute even when you don't have a lot of time. I chose Molten My Day from NAILSINC's Holler-Graphic Collection because it's really impactful - and opaque on me in one coat. I paired it with classic black stamping of bats, a witch and a ghost to just keep it simple. It's definitely not my favorite, but it got the job done. I really feel like this still might be my favorite mani of this entire set. I love the way the berry and the lime green pair together and the pop of the two very different textures of holo between OPI's Extravagance and Girly Bits' Jive Talkin'. This was included in one of my Mani Monday posts, head over to check out the full post to see how I got this mani. I really, really wanted to create alternating stripes using the spider stripes image from the BeautyBigBang04 stamping plate and I love the pairing of orange and purple, so I went with Eternal Beauty and Cosmic Fate from Color Club's Halo Hues line. I really, really love how it turned out with the different spider web images and particularly the orange accent nail. Honestly, these nails weren't actually easy for me to do and are evidence that sometimes the nails that look the most simple can be a struggle. Still, I really wanted to the this mani with the sort of Jack Skellinton face and the black and white stripes, so even though it's not my favorite, I'm glad I did it. I chose Pure and Little Black Dress from Ceramic Glaze for this mani. I really, really wanted to use the Illamasqua Nail Varnish in Freckles this week because it's so gritty and grungy and perfect for Halloween, so I decided to pair it with some really simple ghost stamping with images from BornPrettyStore and BeautyBigBang. Again, sometimes you just have to put together a quick mani and that's definitely what this one is. I really, really wanted to include a smoosh mani in this set and I felt like a background of these bold berry shades would work great paired with black and white double stamping of a graveyard. It's a little bit cute because of the shades and a little bit creepy... and I kind of love that juxtaposition. This was by far the most trying of all of these manicures and if I didn't like way the gritty gradient and stamping turned out for this mani, I wouldn't have posted it. The deep teal shade that I used for the outer ring of my gradient stained the hell out of my cuticles and there was just no getting a pictur that didn't highlight it. Still, I love the mani itself so it had to be shared! I'm a plaid nails kind of a girl, so I knew I had to put together a Halloween plaid mani. I considered just have the orange, white and black plaid, but then it occurred to me that it could look really good with a reverse stamped ghost in there too and I'm so glad I went with it. If you're into stamping and you haven't gotten yourself a plaid plate - I highly recommend. Plaid nails are just infinitely versatile and good for every occasion. I feel like this look - simple gradient with simple stamping - has become a Halloween classic and I really wanted to put one together this year. The KBShimmer Prism Break holographic top coat is really what seals it for me though, the fine holo glitters look just like a sky full of stars! This mani was also included in one of my Mani Monday posts, so you can head over to the full post to check out how I got this mani. As I got towards the end of this, I wanted to do something completely different and keep it light and fun. I started with the verrrrrrrry old Wet N Wild Jewels For Your Highness, which is a really interesting shifty base with rainbow glitters. I paired it with some candy themed reverse stamping and hand painted stitched up tips on my first and pink nails. It's cute, right? I really like this one! Finally, for my last mani, I wanted to A) do some black cat stamping that I'd planned on doing all along, and B) take one more opportunity to use Girly Bits Jive Talkin' in another Halloween mani! I started with a base of Beyond from Color Club's Halo Hues and then added speckled stamping that I amped up with dotted green holo. For the cats I used a plate from UR Sugar and filled in the cat eyes with the same glowing green holo. Who doesn't love black cats for Halloween? If you're interested in keeping an eye on all of my nail art, I definitely encourage you to follow me over at @pblnails. Even though this was a huge undertaking and I didn't think that I'd get through it, I already have plans to do 12 Days Of Christmas Nails over there and will likely have a post very much like this one coming up on Christmas Eve this year! Thanks so much for reading and I hope you have a safe and fun Halloween!